29 Jul What is an Ice Dam and why do I have them? Can this copy be altered to go in the ice dam page? 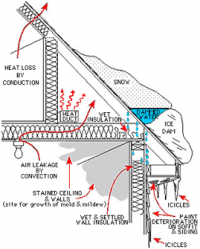 Ice dams typically occur when the outside air falls below freezing and air leaks and/or lack of insulation cause heat to escape to your attic or kneewall and warm the layer of snow closest to your roof causing it to melt. This melted snow runs down your roof to the uninsulated eaves where it refreezes. Over time this ice will build up into a dam, making it impossible for the melting snow to run off your roof and pooling at the eaves instead. Ice dams are caused by several factors including lack of insulation, uncontrolled air leakage, and improper ventilation. Improving each of these areas can be complicated but our team specializes in putting all the pieces together and fixing the root causes of ice dams. Ice dams are created when melted snow refreezes over the cooler eaves of the house. Ice dams are a concern for many homeowners because not only can the weight of the growing ice dams cause damage to the eaves and shingles of a home, the pooling water can leak back into your home causing serious water damage. How do we fix ice dams? If you have ice dams there is most likely an issue with how well your attic or knee wall is insulated, how leaky that space is, and how well adjusted the ventilation is. This means that your home isn’t keeping heat inside the living portions of your home and is instead allowing that air to make its way into the attic and out of your home. 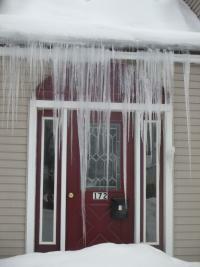 Ice dams are an indicator that your home needs insulation and air sealing. 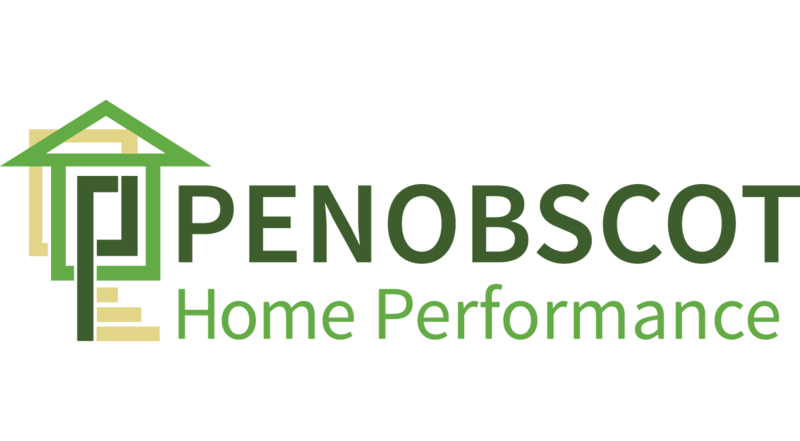 We offer a free one hour home energy consult where our team of highly trained home performance professionals will not only investigate your ice dams but also identify other ways you can save energy and make your home more comfortable. Can I afford to fix my ice dams? If you have ice dams, you can’t afford not to fix them. They can cause thousands of dollars’ worth of damage and if you have them then you are losing heat which costs you money in the long run and makes your home drafty and uncomfortable. Fixing them is very affordable and with up to $1,500 worth of rebates from Efficiency Maine and lots of financing options available this is the time to get rid of ice dams for good. Call us at 469-6100 or click here to schedule your consult today and say goodbye to ice dams.